Our yacht, Mercier, is a Beneteau from Vendee, France and we met her in Bandol. So we were very excited to be asked to host French Families and friends of French Invictus Warriors. 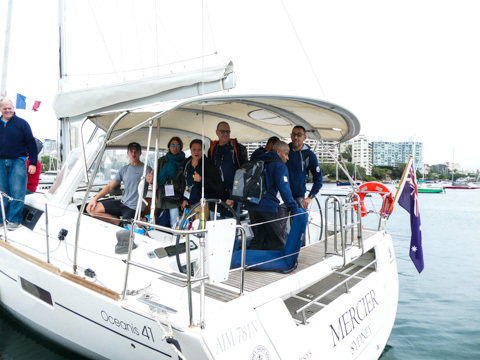 Sydney Harbour is an amazing place to share with guests and we had a Invictus flag to get us an anchorage right at the Sydney Opera House. Frosty, James and I wanted to make sure we got the best viewing position for our guests. 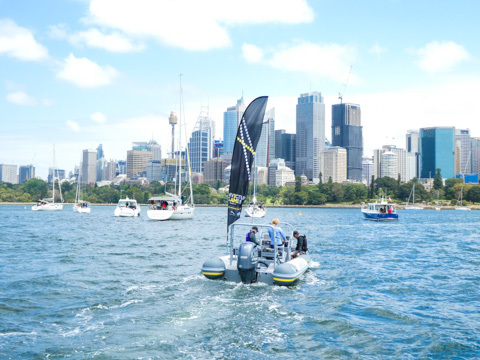 We were able to watch the Invictus Elliott’s practice in Rushcutter’s Bay and we were able to cheer the French team on and take a few photos. We toured around the harbour near the Eastern Suburbs and then followed the Elliotts over to Farm Cove. The clouds disappeared for awhile and we had some very close racing. The weather was kind to us. There were blue skies and the wind was only a little bit chilly. 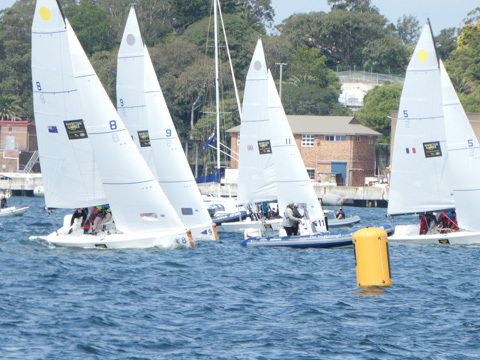 The wind was strong going into Farm Cove until the top mark, but lighter on the return. 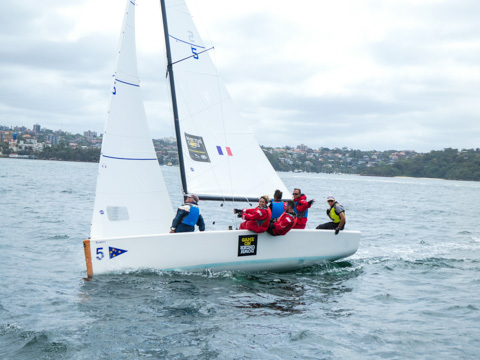 France had won the Gold earlier in the morning for Cyrille Chahboune’s in the Hansa 303 in the morning. ‘Vive La France’ was shouted from Mercier. As loud as we shouted for the French team from Mercier, the Danish team were incredible up on the hill. The Dutch and the UK also had a presence in Farm Cove. 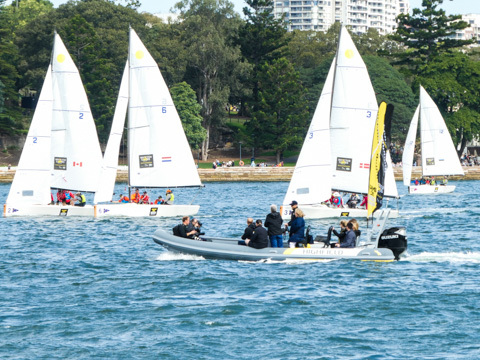 There were thousands of people on shore and in the water enjoying the Invictus Sailing. Our guests seem to enjoy the day too. We hope they enjoy the rest of their stay in sunny Sydney. Good luck to all the Invictus Warriors and their families. Vancouver isn’t kidding when it talks about its harbors, it waterways and the great time you will have sailing in these waters. You do get rain and you also get plenty of sunshine. 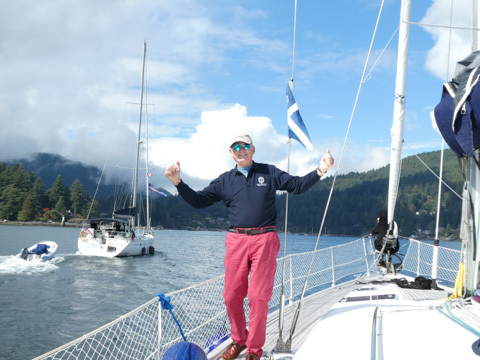 After Pender Harbor, we motored off to Secret Cove with about half the fleet. Turns out that was our last Green Box on a dock, so the order of the afternoon were drinks and sharing nibbles and talking the sun down. Actually before sun set, we heard music and before we knew it singers were pouring onto the docks and we spent the next hour singing songs from Amazing Grace to show tunes to Carole King and Janis Joplin. Old MacDonald got a workout. 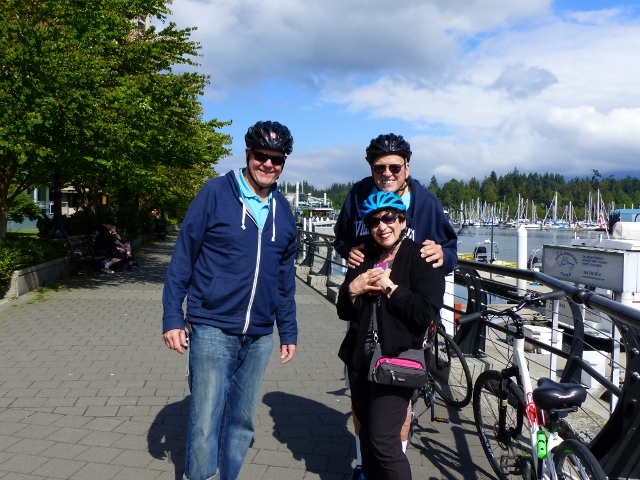 In the morning, we all sailed or motored over to Snug Harbor, a marina that is the last vestige of the Union Steamship Company on Bowen Island. 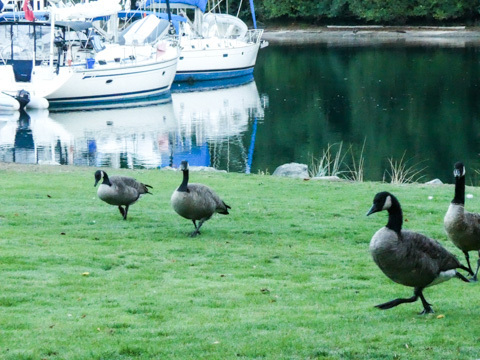 A great marina with shops and a great pub called Doc Morgan’s who fed the whole flotilla and kept Canadian Geese as guard birds. And so we finished where we began, at the Royal Van in Jericho Bay. We had an amazing dinner with singers and an old English Folk Song, we had “thank you”s and that we all had a terrific time was duly noted. 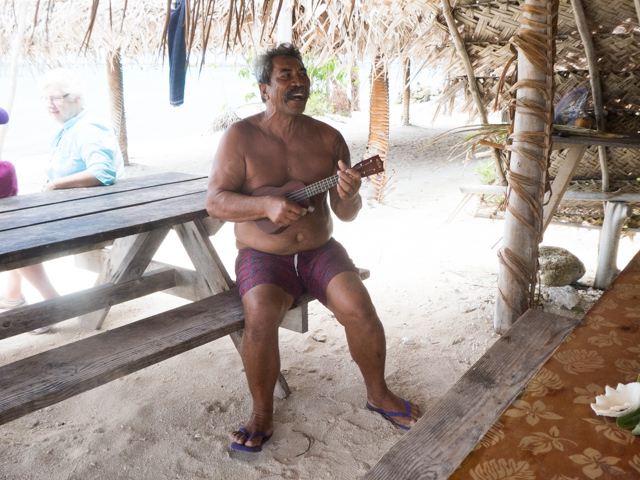 We were asking when the next ICOYC cruise might be scheduled because it is something many of us would like to do again. 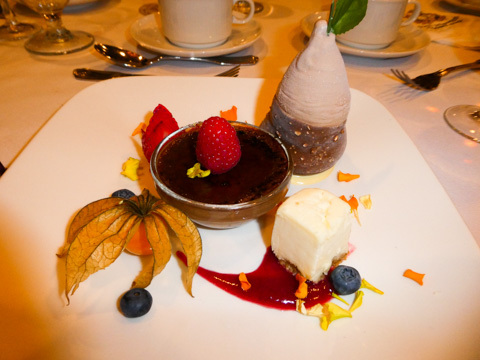 I have to put it in writing that the despite what you might hear, the Death by chocolate was not the highlight of the trip, but it was certainly in the top ten. 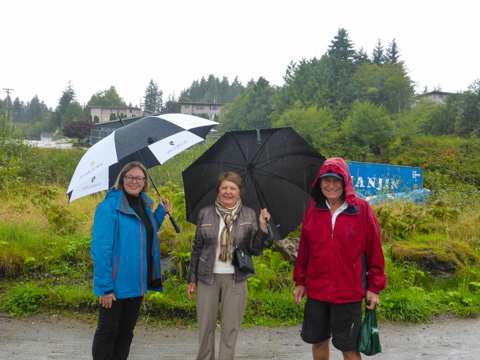 The Sojourn sailed into to Prince Rupert on the 28th August. Sandy and Gaila were not sure our visits would coincide, so it was a surprise when we received a text saying hello. It was very foggy, rainy and visibility was low, so the ship’s fog horn blowing as we came up the channel. The noise woke Ric up and he said we are having breakfast come up to the Crest hotel. It was right next to the dock, so we walked up prepared for the 5 minutes in the mist. On the way up to the hotel, we passed the Museum of Northern BC. This post and beam building isn’t Corinthian. The beams are massive. 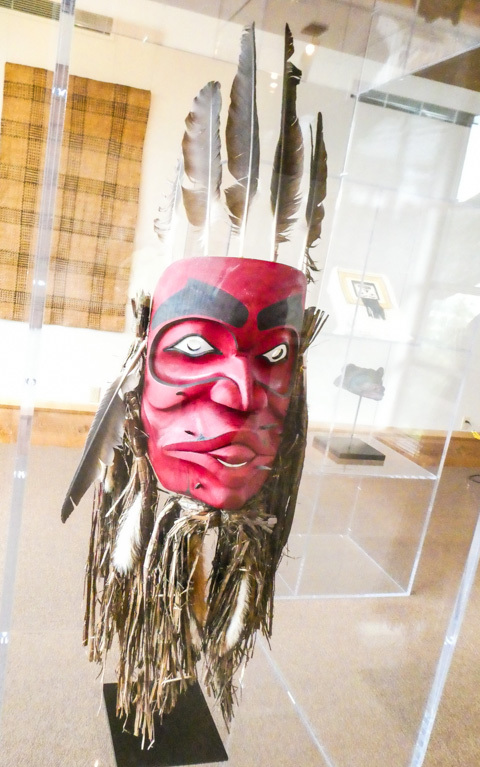 The museum itself is created to resemble a Northwest Coast longhouse. The artifacts are incredible. The masks and artifacts are handsome. There are weavings, capes made of maarten skins and walrus whiskers. Buttons are incorporated into the weaving and made of mother of pearl. This red mask might have given you pause on a misty evening. Afterwards, Sandy wants to go for a walk in the pouring rain. She is serious. She has an umbrella. She shows us the trail map. The rain is getting heavier. We go back to the Soujourn and find our raincoats and umbrellas and change to our mud shoes. Walking past the Port Edward waterfront, past the entire industrial waterfront and then on a path, at the end we will find a restaurant. The industrial waterfront goes on for quite a ways, the trail is the old goods train line that has been converted to a hiking trail. When we finally got to the trail head, the outlook was gorgeous and large bridges made the trail easy to traverse. The restaurant at the end of the journey had every appearance of being closed. Luckily for us, it was open and had the best French dip sandwich in Canada. We return to the dock and we are getting used to the incessant rain, so we go and look for the Sunken Gardens, a small two story gardens near the courthouse. 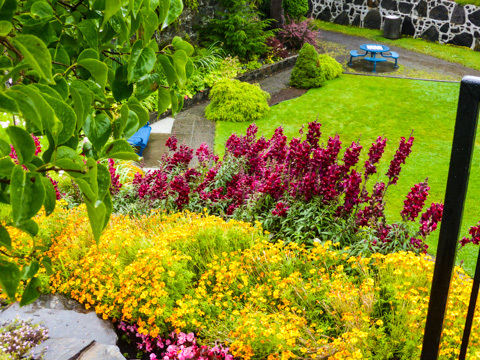 This rain means the Sunken Gardens are lush, even in late summer. 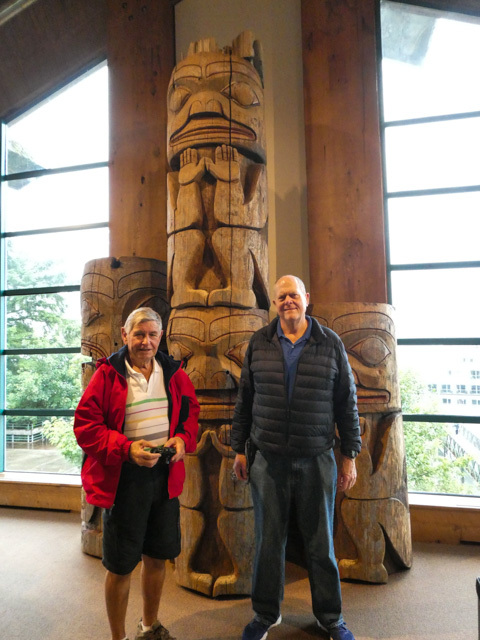 We will be meeting up with Ric and Sandy in September in Vancouver, but it’s great to catch up in Prince Rupert, BC. Even in the rain. Where to begin? 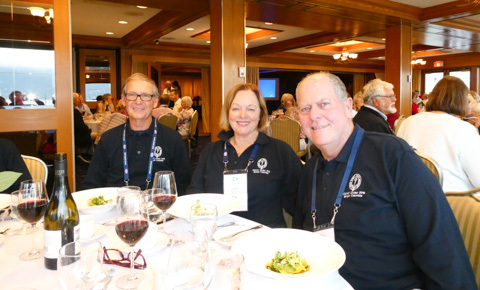 Our DAR friend Gayle was talking to me for months about the Captain James Cook Society, a world-wide society who study Captain Cook and his travels. When we said we were coming to Anchorage, Gayle said she would be our tour guide. 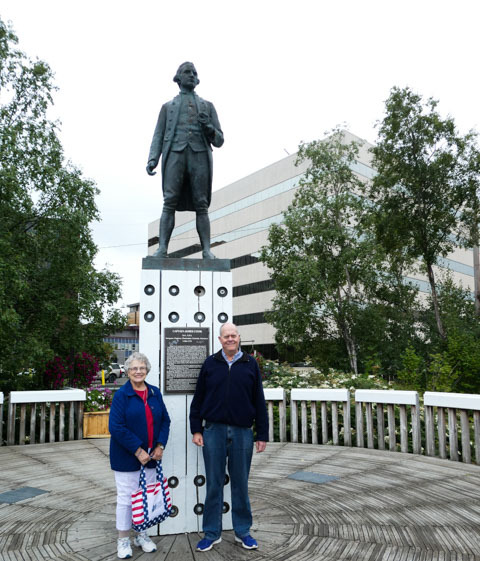 Our first port of call was the statue of Captain Cook overlooking Resolution Park and the silted waters of Cook inlet. 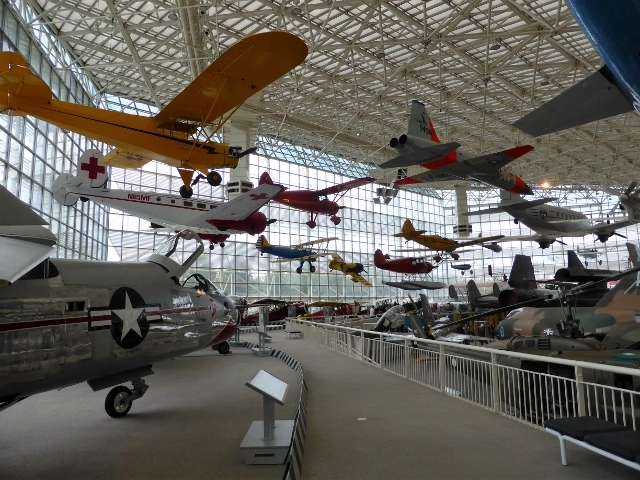 Followed by an informative tour at the Anchorage Museum, with erudite docent, Nancy Britton. 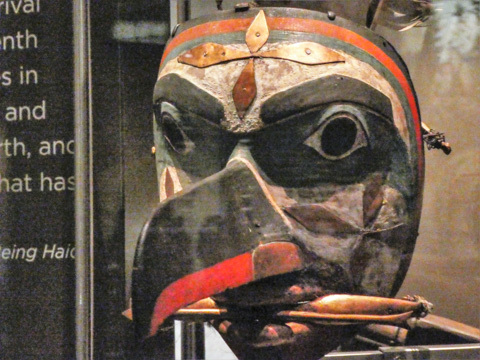 If you can visit the Anchorage museum and have a tour with Nancy, your appreciation of Alaskan First Peoples’ live before and after First Contact will be greatly enhanced. Literally at dawn the next day, we boarded the train to Seward. We had booked the dome car, with 270 degree views and plenty of scope to go outside to see the verdant or frozen Alaskan landscape. We passed several glaciers and learned that there are over 100,000 glaciers in Alaska. There are 616 officially named glaciers. The photos of the lakes and icy water were taken from the inside of the train and are not photo-shopped. It is cold in Alaska but it isn’t windy like Sydney. 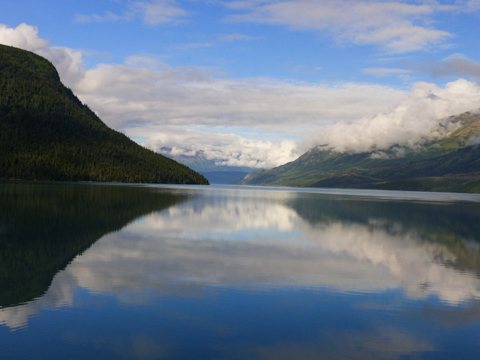 The water of the lakes were perfectly flat and acted like a mirror. Gayle took us to Sea Life in Seward and it was great to see puffins, otters and seals. 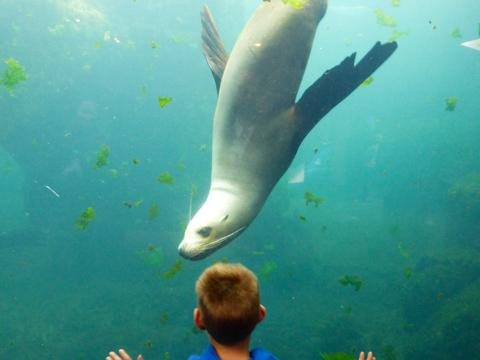 The seals seem to interact with the children. Thanks to all the lovely people in Anchorage and in Seward who showed us such wonderful hospitality. It was special. James and I last visited Tahiti and Bora Bora in 1985. We have to say it was romantic and if you are looking for the most beautiful lagoon to set a Tiffany’s commercial, this would have to be it. The Aranui came into the lagoon off of Vaitape and anchored. 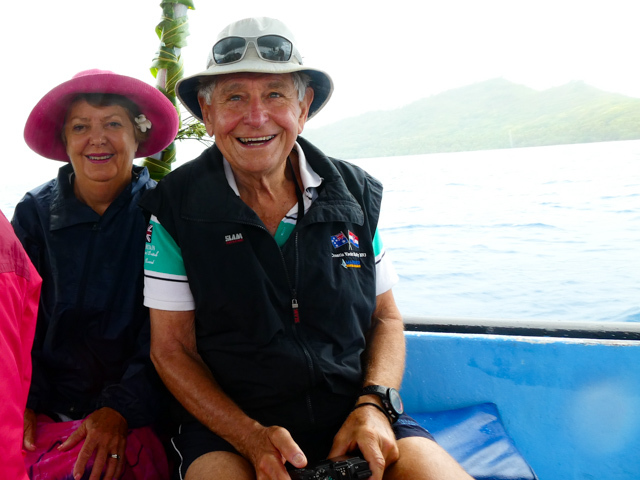 We had a wet landing and disembarked to a motorised pirogue or canoe. 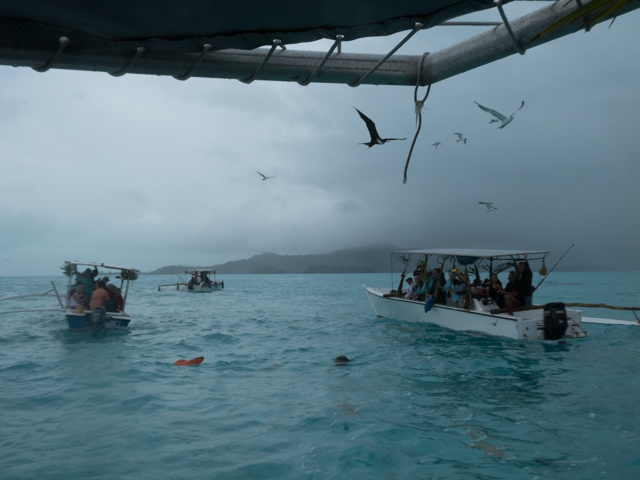 Other passengers, went to swim with sharks and rays and others decided to take a truck tour around the island of Bora Bora. The rain didn’t dampen us because we were under cover on the canoe but we missed some of the Tiffany blue water. 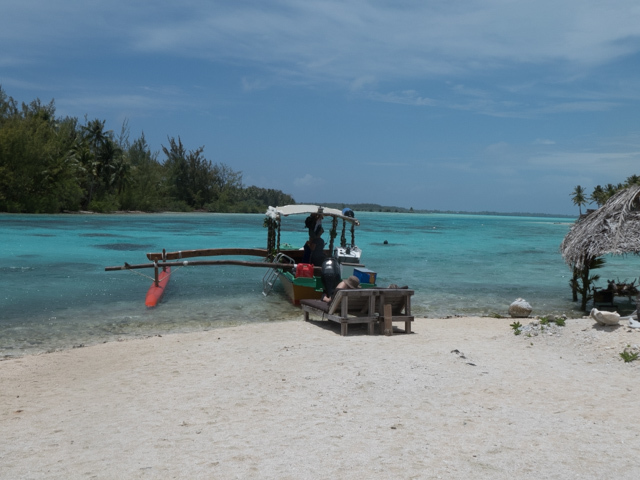 The barge took us to visit the shallow lagoon, the sharks, rays and terns and then to a beach where you take a swim and a mudbath of coral shells. We also passed a turtle sanctuary and so many bures posted over the water. Our guide was the very image of Disney’s demi-god, Moana, but was beautifully spoken in French and English. That’s James in the yellow shirt and our guide driving. We went past the Le Meridien bures on the water but we didn’t see any turtles. Still we were glad to hear an International hotel is looking after the sea turtles. We went for the mud baths with the white coral mud, simply rejuvenating as you can see in the photo. 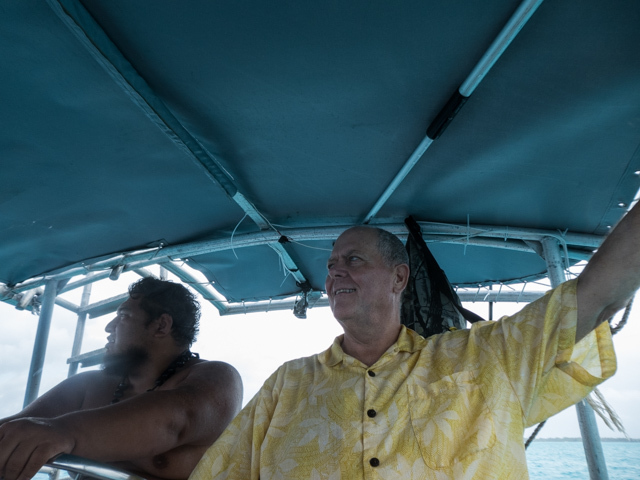 The sun started to peek out of the clouds and still on the canoe with Moana we went to a motu or small atoll, which belonged to his Ukele playing uncle. We could have a swim, they gave us fruit and coconut in abundance and the best part would have to be the singing and ukele. 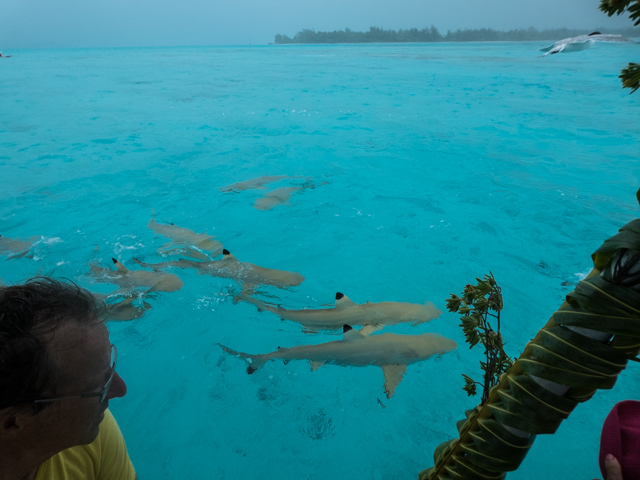 These little motus are the Bora Bora half acre, just private and lovely. You need something from the shops, just take the pirogue. Back to the Aranui because our picnic on Motu Tapu, was rained out. Later we go pearl shopping and playing in Vaitape but we didn’t have enough time to visit Bloody Mary, which only opens in the evening. 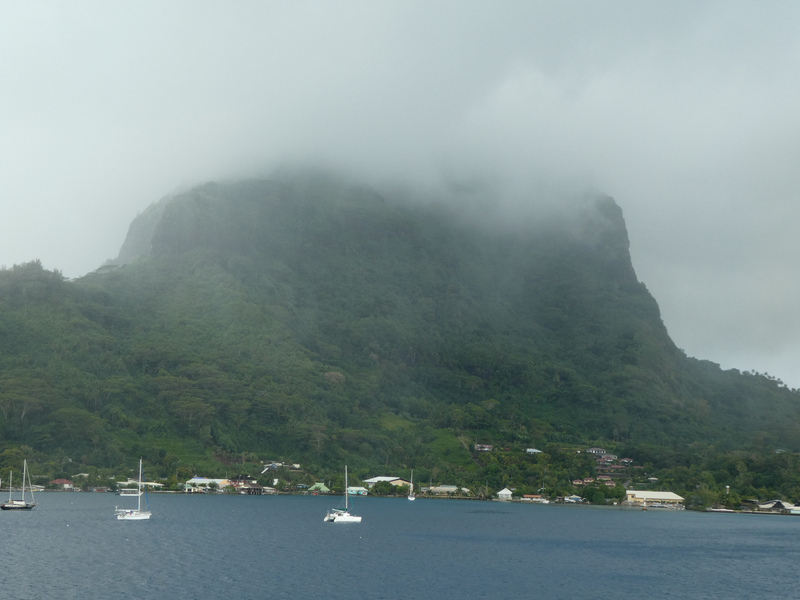 But in the evening we consoled ourselves with mohitos and chichis and the Aranui took off for Papeete. 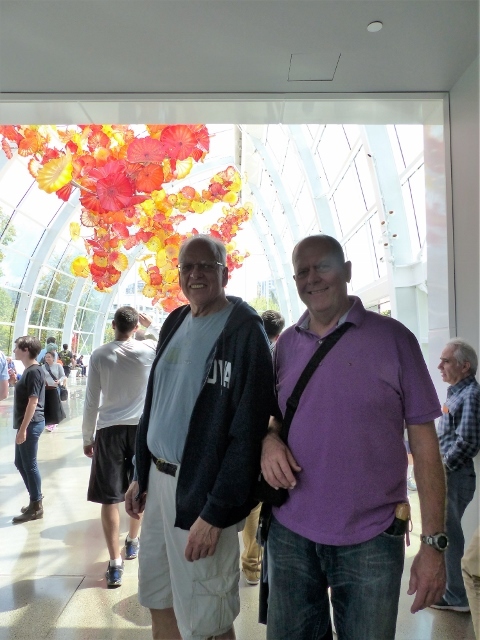 James and I crewed on two yacht deliveries from Hawaii to Australia in the 80’s. Each day at sunset, the entire crew would sit in the cockpit and talk about where we had just been, where we were going and especially where we wanted to sail too. 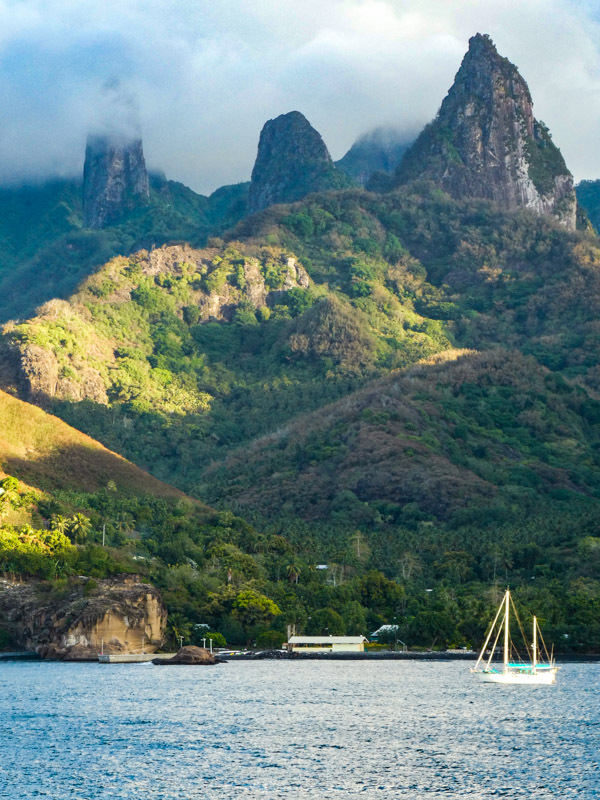 Certainly, one place that we all dreamed of was the wild and remote Marquesas Islands. 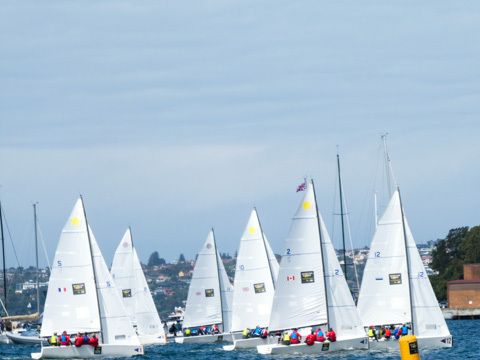 It was one that was still on the bucket list, albeit with the idea of sailing on a yacht. 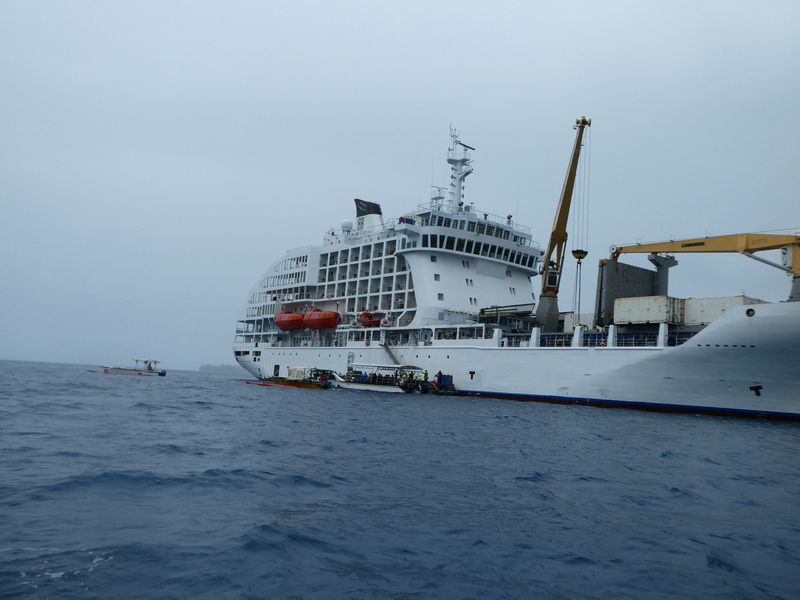 Imagine my delight when Sandy Lawson came by with a brochure of the Aranui 5, a hybrid freighter cruiser, which leaves Papeete and sails via the Tuamoto Islands to the Marquesas Islands. Imagine my surprise when James said “Yes”. We are visiting Papeete for the first time since 1985 and staying for two days. 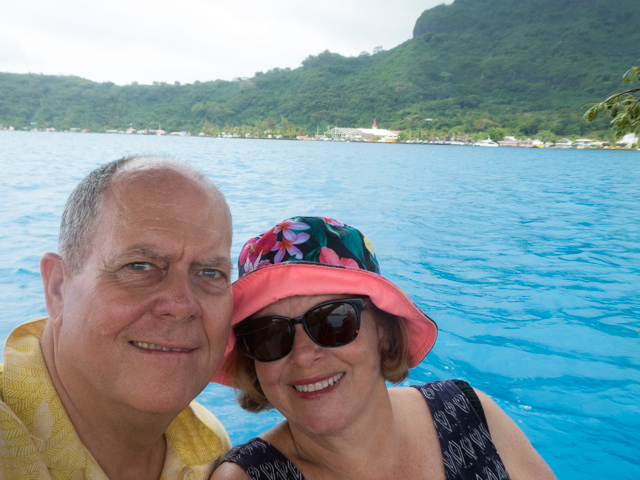 This gives us time to reconnect with French Polynesia and get ready for the cruise, strolling through Papeete with Rick and Sandy. There are some new buildings and a lovely new information centre and park. Many of the older buildings are looking decidedly shabby chic, still the ladies making flower garlands and crowns are still beautiful to view. The old wooden Church looks the same and the market looks newer, with gorgeous entertainment. 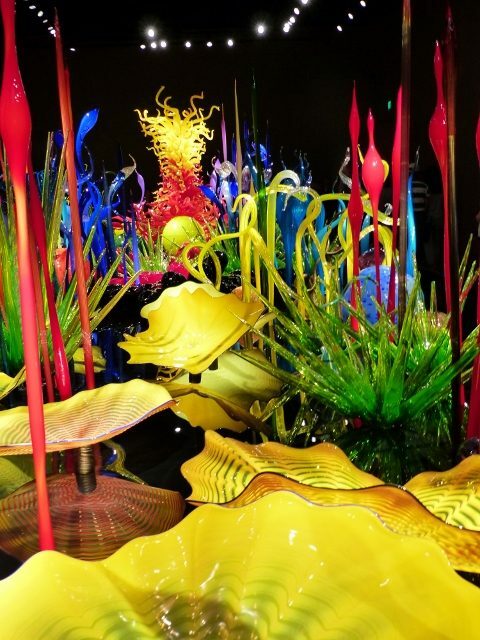 We visited the wonderful Robert Wan Pearl museum. They have an amazing selection of pearls as well as the Pearl museum. We missed the Le Trucks, they were so efficient and available. We waited for a bus for almost an hour and finally stalked a taxi at Carrefour. Le Trucks are still working on Bora Bora, which was good to see. 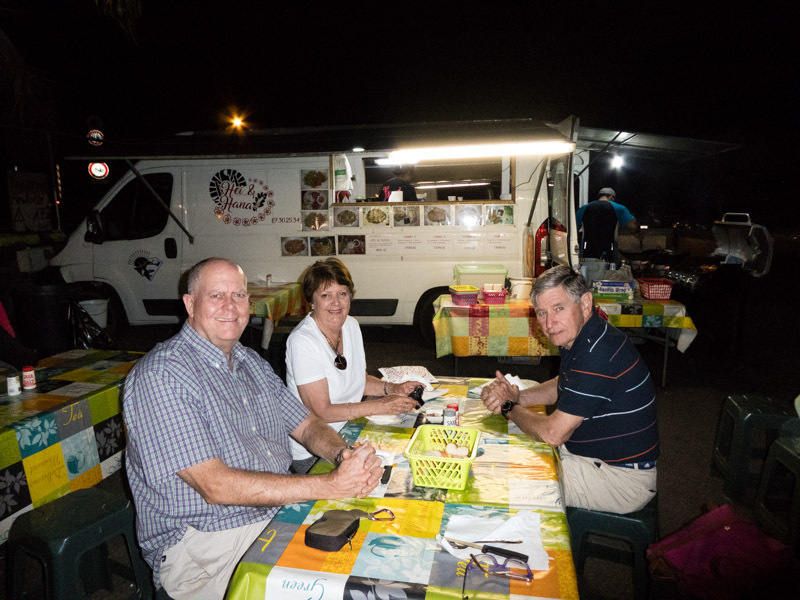 The most interesting food was at the local food trucks called Les Roulettes. Each evening you walk down to a local car park and watch as the food truck set up their stoves and barbecues outside the truck. We had wonderful MahiMahi, entrecote steak and chow mein. We didn’t have crepes but they were available too. The serving sizes were huge and the food was delicious. 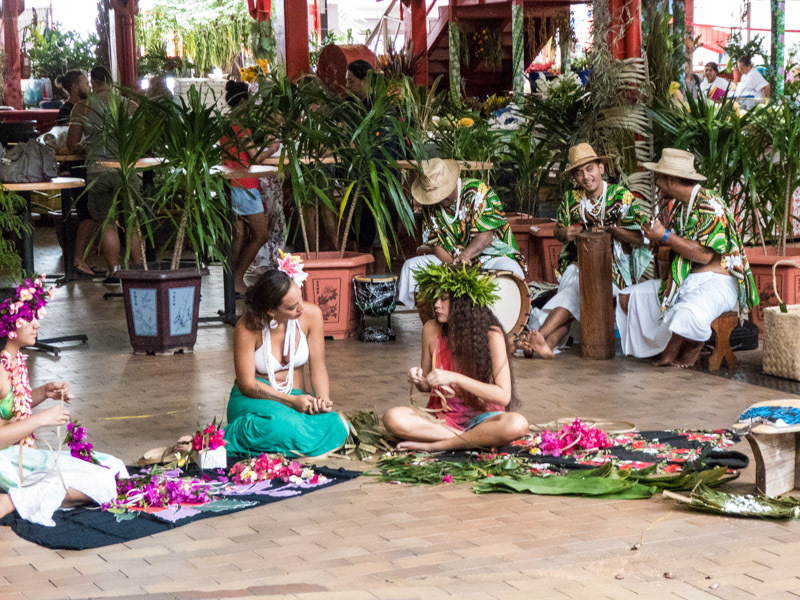 Papeete is lovely to explore but book a tour or get a taxi because public transport isn’t easy, unless you take a ferry. Try the food trucks and the markets as well as the restaurants. Bring your insect repellant and sun screen and plan for a wonderful time. In 2012, we wanted to visit Capri and made a booking at the local marina, which wasn’t confirmed, more of a ‘call us on the day’. Still an hour before we were due to arrive at Capri, the port emailed us and said ” Sorry, we are full.” We motored round the island and anchored in Marina Piccola. Staring at the island, but not able to land was frustrating. 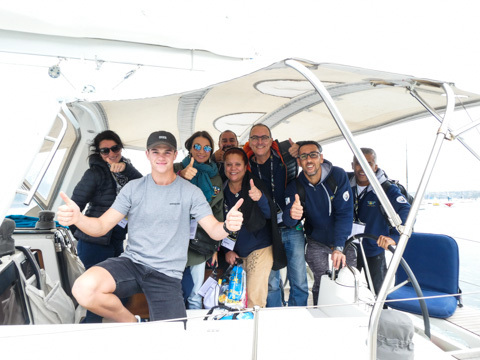 This time we were smarter and left Mercier in her lovely dock in Salerno. 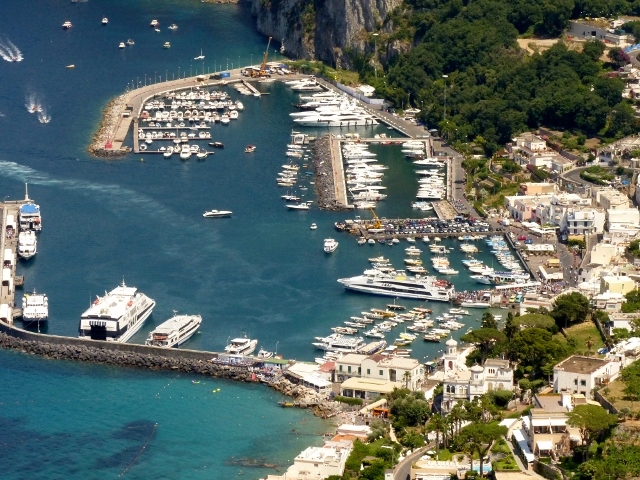 There is only a small marina on Capri and many large yachts. Eleven of us made our way from Minori to Capri via a ferry. 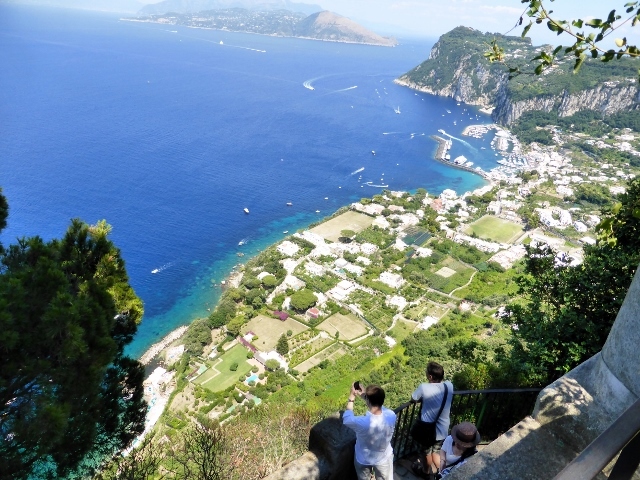 Easier, smarter, faster, so consider taking a ferry and not a yacht over to Capri. 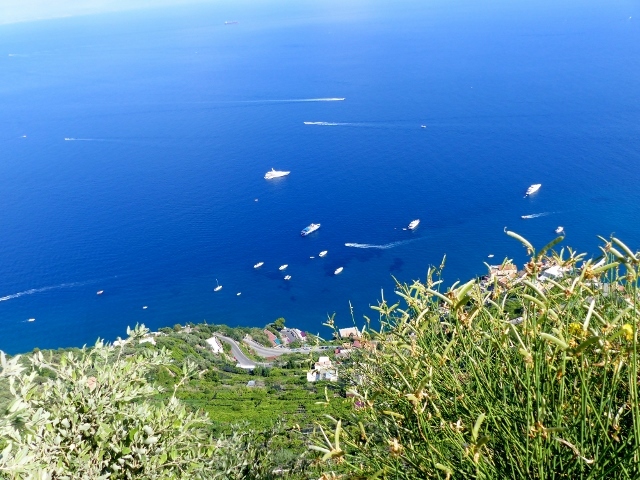 Ischia, Sorrento or Salerno are all fairly close and have safe marinas in which to leave a yacht. 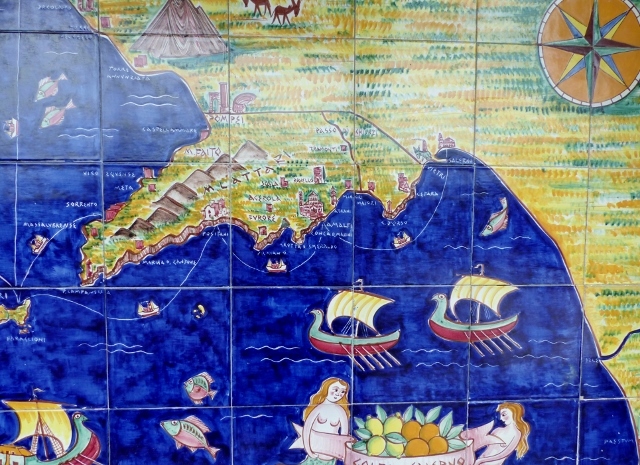 Once there, we split and half the party sailed off to the Blue Grotto and the rest of us journeyed up to Anacapri. 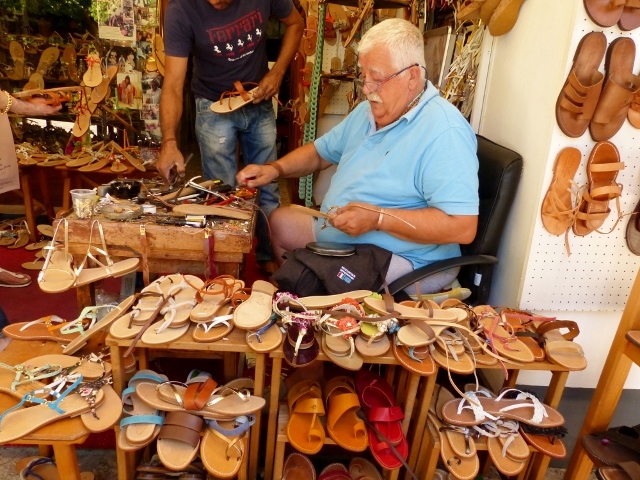 We wandered round tiny steep streets, tried on hats, visited Churches and watched a shoe maker make sandals to order. We met later for a lovely garden lunch. Barbara and the perfect hat. 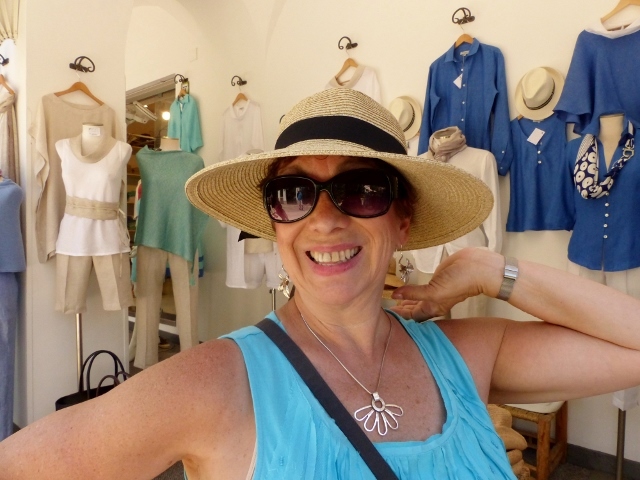 Also great shopping in Capri. The excitement came with trying to ensure we got the bus back down, by the time three buses got to us they were full. On the fourth pass, finally a bus arrived only half full. Some clever people thought they would push in but we managed to block those who didn’t want to queue. We empathized with the sardines we had for lunch. Capri, we’ll be back and next time, we’ll take a ferry and stay awhile. Fifteen years ago, James and I stayed in Positano; we thought it was magical. However, trying to find rooms for eleven of us, the best value seemed to be in Minori or Maiori. We all found Minori to be less touristy and very friendly. Minori was more like the Amalfi and Positano we visited fifteen years ago. If I was going five-star, I would prefer Ravello but given our budget Minori was perfect. Ravello is just an hour’s walk up the hill, but quite a steep lung buster according to Miriam, Ed and Frank. 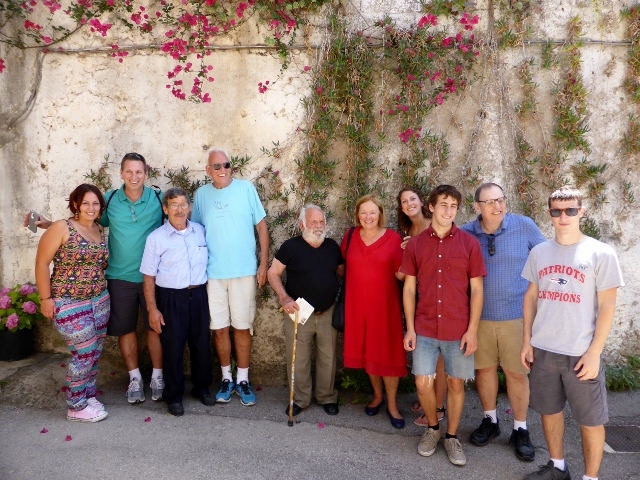 It is incredibly scenic as James, Barbara and I can attest to, as we walked down to Minori after a scrumptious lunch at Enotavola Wine Bar at Palazzo Della Marra in Ravello. Matt and Joseph ran up and ran down; steepness was no barrier for the incredibly fit twins. 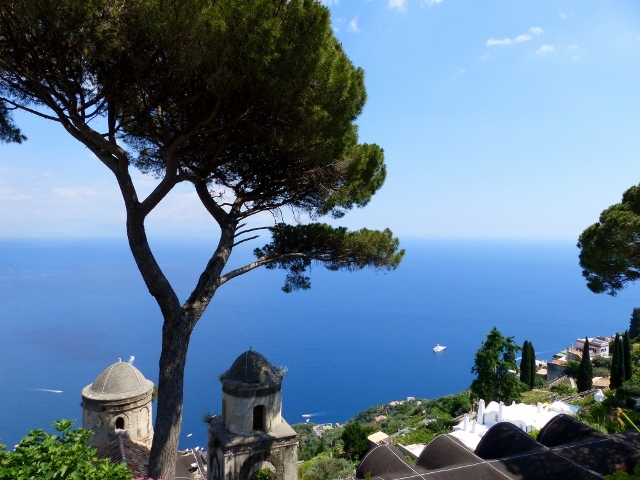 Ravello was the site of several weddings and we saw bridal fashion from demure to haute couture. The heels were six inches high but the outfits were amazing. Natalie Chapman, is this wedding wear? 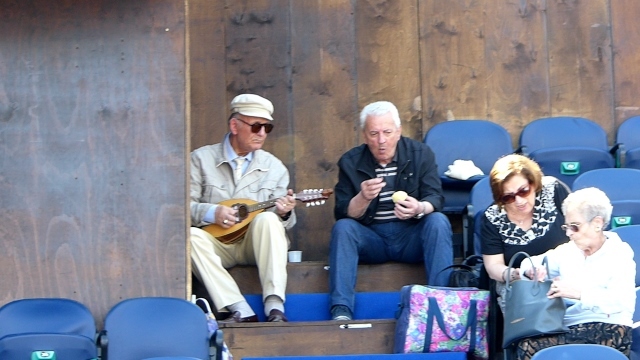 The music festival had not quite started but the stage was set up at the Villa Rudolfo and there were several members of the Ravello Vista Social Club playing wonderful songs and singing. There was an amazing Sonica gallery of photos of musicians by a musician, Guido Harari at Villa Rudolfo too. 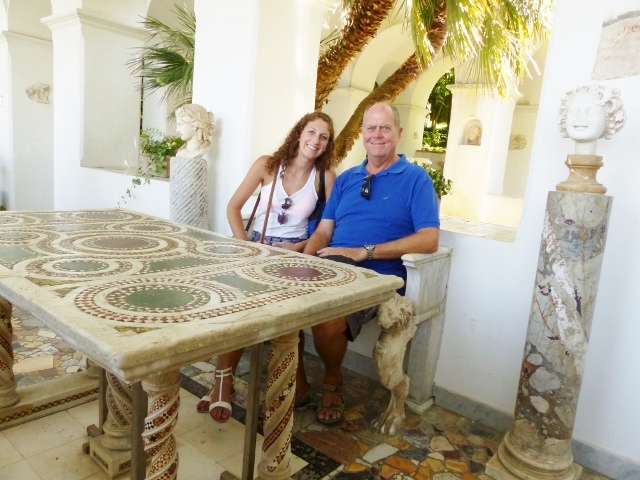 Villa Cimbrone was the site of lush gardens and pleasant walks. 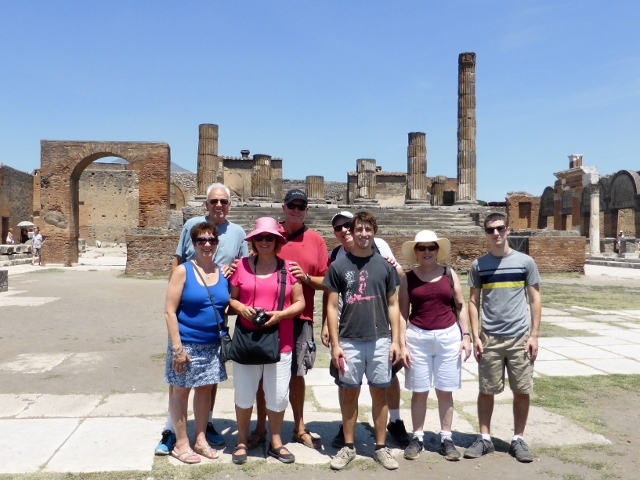 There is plenty to do in Campania, a guided tour of Pompeii was educational and fast paced. We could see Vesuvius in the background and we were happy to note there was no smoke or activity. Everyday we fall a bit more in love with Campania. Sailors might want to tune out now. We have photos of the marina at Capri but not today. Today it is about the people who make me smile and how Italy has touched all of us. 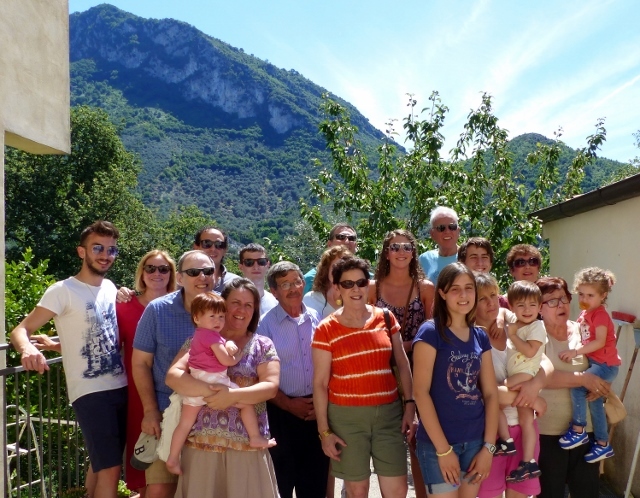 My paternal grandparents were born in the beautiful village town of Giffoni Valle Piana. In the early 20th Century, because there was not enough work in Italy to pay taxes, create a life and have a family. Four million Italians arrived in America from 1880-1920. My grandparents were two of those immigrants. They came from a valley above Salerno and the Amalfi Coast. This coastline and coastlines further south are exquisite. Various shades of green on the stone hills speak of olives, grapes, lemons, chestnuts and hazelnuts. In this area, most mozzarella is made from buffalo milk. It is simply OMG delicious. There was a thread of connection with Giffoni. My Aunt Louise gave me quite a bit of information and old family photos, which made the search for our Italian families possible. I have been pleading with my cousins to join me in returning to Giffoni for several years after my first trip in 1999. After all Giffoni is now famous because it hosts the Giffoni Film Festival. Even Meryl Streep has visited and she wasn’t a cousin. This year we have made headway. 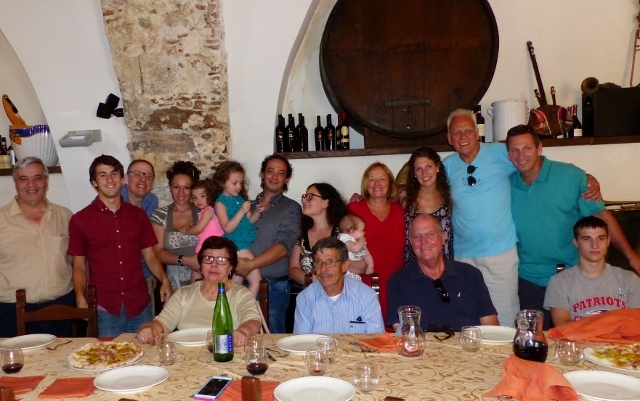 We are a party of eleven De Angelo’s, comprised of two generations. 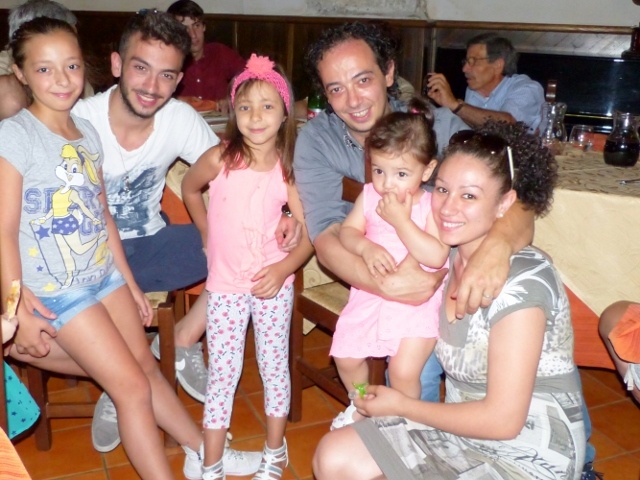 We planned a day, with cousin Sebastiano’s assistance, for our family reunion in Giffoni. Allora, what a day! Here are the photos. 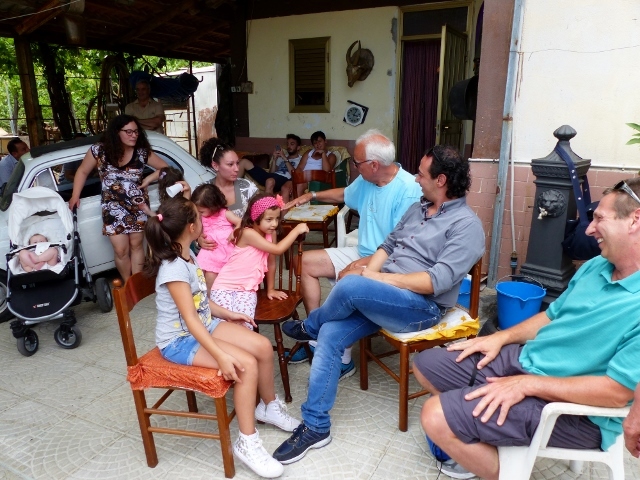 Cugini and Carmine, the paterfamilas in Giffoni. The joy of the day was almost overwhelming and the two groups had such a good time. 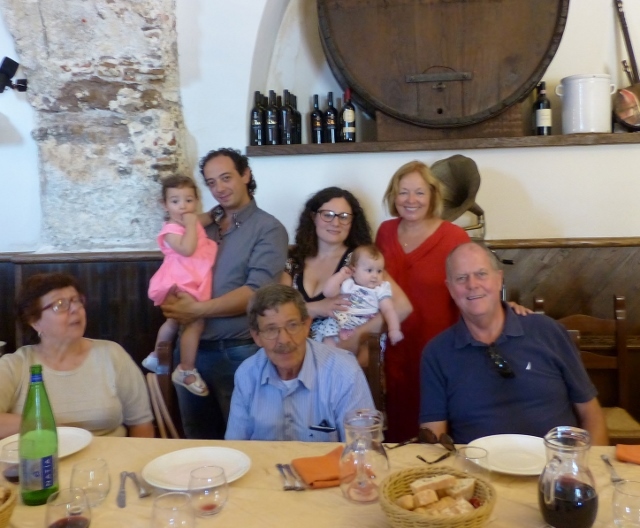 The Marrandino cousins, in my Nonna’s neighbourhood, Vassi. 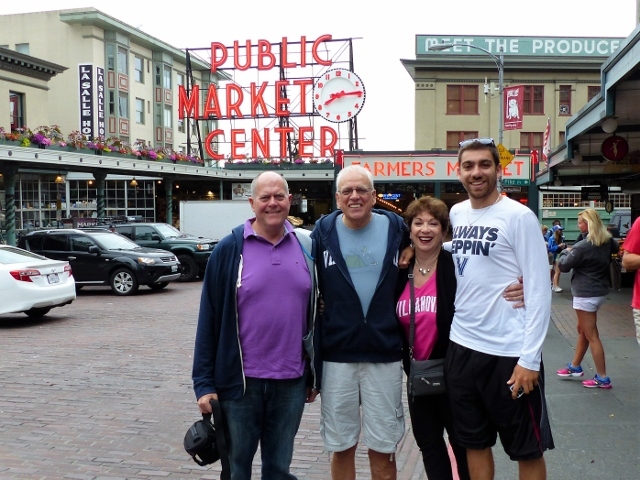 Another trip soon we hope!! !